The new medical invention was inspired by "Fix-a-Flat" foam for repairing tires, and could save countless lives on the battlefield. One of the harshest realities of war is that you're more likely to die bleeding out from a simple flesh wound than pretty much anything else. Treating gunshot wounds on a battlefield is an agonizing process, in which the medic has to pack gauze deep into the wound, and start over if the bleeding doesn't stop. 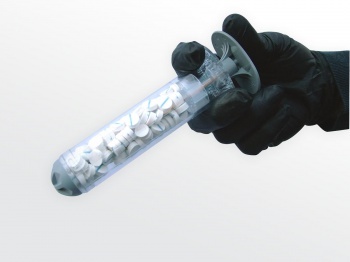 However, Oregon-based startup "RevMedx" has devised an ingenious new way to quickly, and (relatively) painlessly seal up bullet holes in the field, using a syringe of tiny sponges to seal up gunshot wounds much the same way "Fix-a-Flat" foam repairs tires. Called the "XStat", the device could boost survival and spare injured soldiers from additional pain by plugging wounds faster and more efficiently than gauze. The XStat team initially experimented with foam, like in the tires, but found that blood pressure was too high, and would push the foam out. So, they turned their attention to sponges, and discovered it was the perfect material. Sponges work fast. In just 15 seconds, they expand to fill the entire wound cavity, creating enough pressure to stop heavy bleeding. And because sponges cling to moist surfaces, they aren't pushed back out of the body by gushing blood. But actually getting the sponges into the wound in the first place proved to be the bigger obstacle. Eventually the team designed a 30 millimeter-diameter, poly-carbonate syringe that stores with the handle inside to save space. To use the applicator, a medic pulls out the handle, inserts the cylinder into the wound, and then pushes the plunger back down to inject the sponges as close to the artery as possible. Furthermore, to ensure that no sponges are left inside the body accidentally, they added X-shaped markers that make each sponge visible on an x-ray image. According to RevMedx, the company and the military are now in final discussions with the FDA.